The Orthodox Church is often accused of neglecting the world for the sake of liturgical worship and spiritual life, turning primarily toward the Kingdom of God to come, disregarding challenges of the present. In fact, however, whatever the Church says, whatever the Church does, is done in the Name of God and for the sake of human dignity and the eternal destiny of the human being. It is impossible for the Church to close its eyes to evil, to be indifferent to the cry of the needy, oppressed and exploited. True Faith is a source of permanent struggle against the powers of inhumanity. Patriarch Bartholomew and Archbishop Justin also established a joint taskforce on modern slavery and signed a joint declaration condemning all slavery as an egregious sin, encouraging governmental actors to more effectively prosecute offenders, prevent further slavery, protect its victims, and promote hope wherever people are exploited. We condemn all forms of human enslavement as the most heinous of sins, inasmuch as it violates the free will and the integrity of every human being created in the image of God. We commend the efforts of the international community and endorse the United Nations Protocol to Prevent, Suppress and Punish Trafficking in Persons, especially Women and Children. We pray that all victims of modern slavery may be liberated in order to rebuild their lives and that the perpetrators may be brought to justice. We repent for not doing nearly enough swiftly enough to curb the plague of modern slavery, acknowledging that our ignorance and indifference are the worst forms of tolerance and complicity. We are judged each day by what we refuse to see and fail to do for the most vulnerable among us. We appeal to local and national governments to pass and implement strict laws against modern slavery, with a budget and capability to ensure organizations are held to account for modern slavery in their supply chains, while also allocating resources and services for trafficking victims, who are exposed to and endangered by such injustice. We encourage our leaders to find appropriate and effective ways ofprosecuting those involved in human trafficking, preventing all forms of modern slavery, and protecting its victims in our communities and promotinghope wherever people are exploited. We urge our faithful and communities – the members of the Orthodox Church and the Church of England – as well as all people of good will to become educated, raise awareness, and take action with regard to these tragedies of modern slavery, and to commit themselves to working and praying actively towards the eradication of this scourge against humanity. 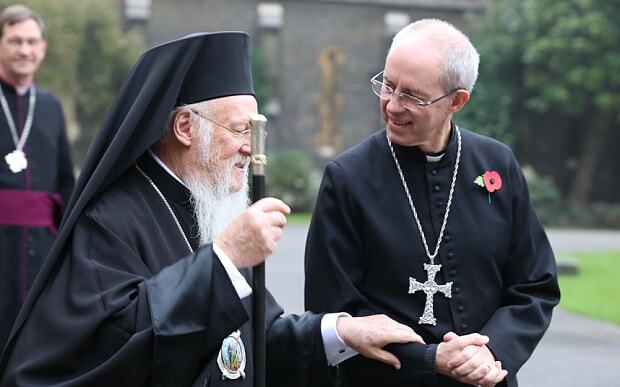 We commit to the establishment of a joint taskforce for modern slavery to bring forward timely recommendations as to how the Orthodox Church and the Church of England can collaborate in the battle against this cruel exploitation.